Everyone is asleep in their beds, it's the middle of the night and suddenly at 3.32 am all hell breaks loose. No one living in and around the central Italian city of l'Aquila will ever be able to forget that terrible night ten years ago: 6 April 2009. The symbol of that tragedy is still there, the students' home where eight youngsters died when it collapsed in a devastating 6.3 magnitude earthquake that killed a total of 309 people, injured 1600 and displaced 80,000. Exceptional efforts were made by the hundreds of firefighters, Red Cross and civil defense officials and volunteers that were deployed to provide assistance to the stricken population. 100 residents were extracted from collapsed buildings. 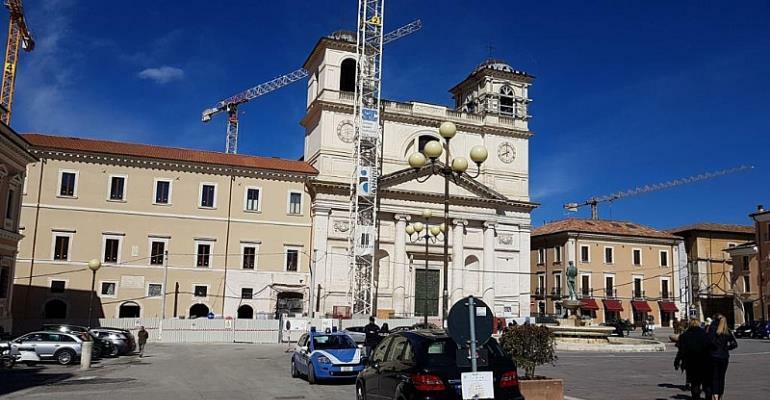 The city of l'., the capital of the Abruzzo region, today remains practically deserted with very few people having been able to return to their old homes. The historical city is an empty box where very little commercial activity takes place and the former population has become accustomed to living in the 'new towns' made up of buildings and temporary homes which sprung up or were made available not far from the old city when the disaster struck..
An entire generation of students never set foot in their old schools again. L'Aquila today continues to be a huge construction site with cranes and dust everywhere. Progress has been made but particularly for official state buildings work has been very slow. Efforts have been hampered mainly by bureaucracy and the need to avoid corruption. The beautiful central Piazza Duomo with its famous 18th century Church of the Blessed Souls, badly damaged in the quake, used to be where the market was held every morning and where residents gathered. All this was wiped away in a matter of seconds and people were forced to change their daily lives overnight. Ten years on there are hopes that this will one day be possible again. A few shops have reopened along the Corso Vittorio Emanuele but everywhere on the buildings there are “To Rent” signs. Although everyone agrees that L'Aquila will never return to being what it was many feel a rebirth of the city can take place. “It will take time, maybe another ten years, but it will happen”, said Giuseppe Palumbo, who was one of the first to reopen his butcher's in Via Garibaldi. Another resident said that “if the central post office were reopened again in the main square that would be a very important message”.